For the Sega Mega-CD game, see Road Rash (Mega-CD). For the Sega Saturn game, see Road Rash (Saturn). Road Rash (ロードラッシュ) is the first game in the Road Rash series of motorcycle racing games developed by Electronic Arts. Originally released for the Sega Mega Drive in 1991, it has since been ported to other consoles, including the Sega Master System and Sega Game Gear. It should not be confused with the Mega-CD game, also known as Road Rash or the Saturn version. In Road Rash, the player competes in illegal street races in California, where competitors are given free will to deliberately damage competitors to get to first place. Damage is incurred by punching competitors ( ) or ramming into them. accelerates, brakes. Race courses are littered with everything from hills to traffic to roadside obstacles that can hurt a competitor or the player, and since the races run in real time, crashing is costly, as you must get in the top 3 to move on to the next level. You may choose which level to play each time. 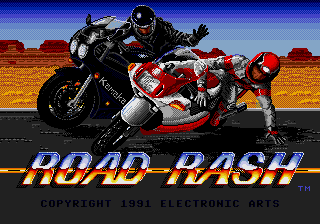 On the Mega Drive, Road Rash was followed by Road Rash II and Road Rash 3: Tour De Force. The Master System version of Road Rash retains the vast majority of content over its Mega Drive counterpart, though most of the graphics were re-drawn for the smaller resolution and fewer colours given by the hardware. On the Master System, the top speed is lowered, and much of the road-side scenery has been removed, and there appears to be fewer racers on the track at any given time. While the track layouts are broadly the same, hills are less pronounced on the Master System, and take longer to complete due to the aforementioned speed issues. All digitised sound has been removed, as has the rev counter in the HUD. The Game Gear port is much the same as the Master System conversion, but has to reduce the size of its HUD further in order to fit all important details onto the screen. This also means less of the road is visible to the player. Published under license by: U.S.Gold Ltd. Licensed by: Sega Enterprises Ltd.
© 1991, 1993 Electronic Arts Inc.
Main article: Road Rash/Magazine articles. Main article: Road Rash/Promotional material.